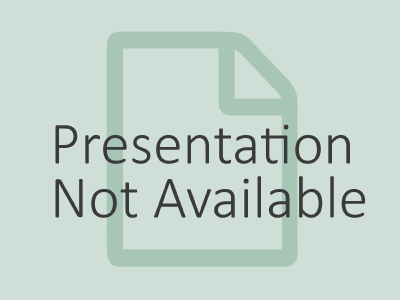 Fu, L-L. and Morrow, R. (13-Dec-16). 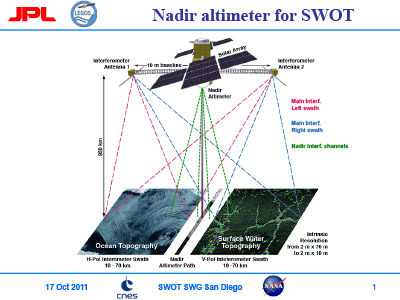 The primary instrument of SWOT is a Ka-band radar interferometer for measuring the elevation of water surface over land and ocean. 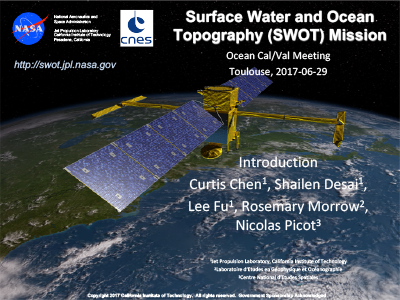 The oceanographic objectives of the mission are to observe sea surface height at scales approaching 15 km, depending on the sea state. 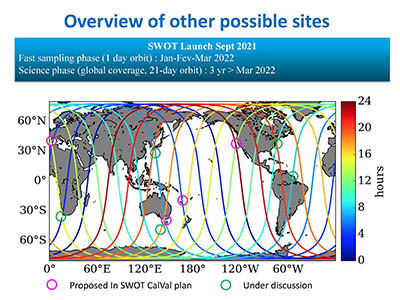 The measurement technique and the development of the mission will be presented with an emphasis on its science program with an outlook on the opportunities and challenges. 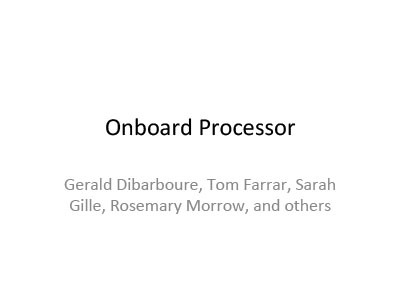 Roge, M., Morrow, R., and Gerald, D. (13-Dec-16). 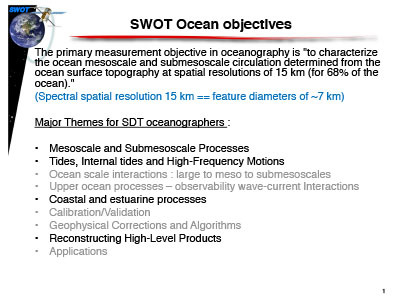 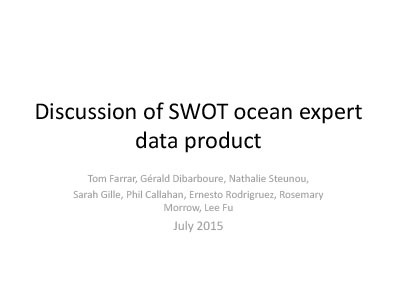 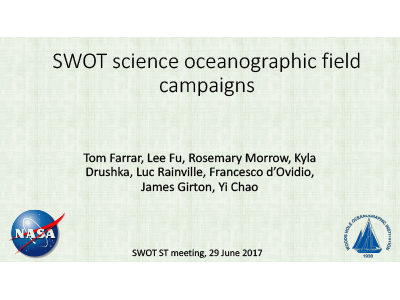 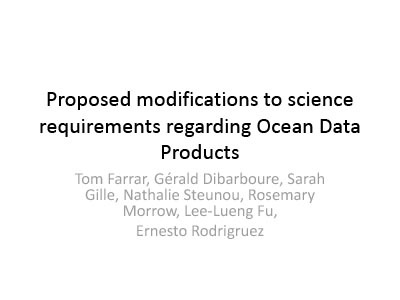 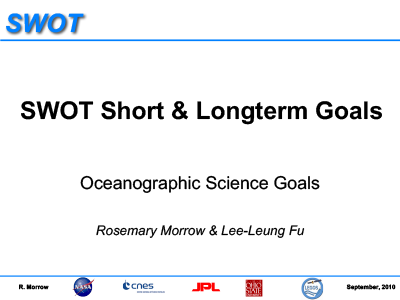 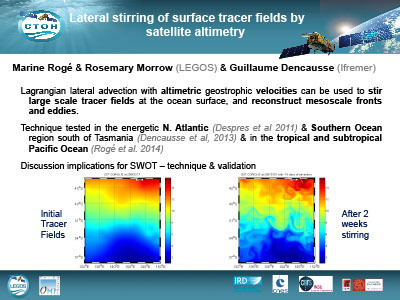 The main oceanographic objective of the future SWOT mission is to characterize the ocean mesoscale and submesoscale circulation by observing the fine range of ocean dynamics (from 15-300 km). 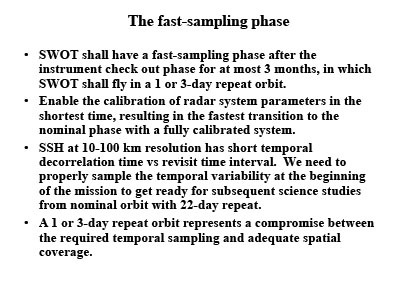 However it will not capture the time evolution of short mesoscale signals. 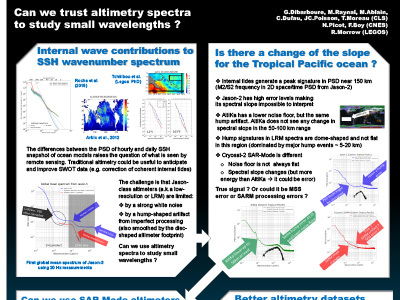 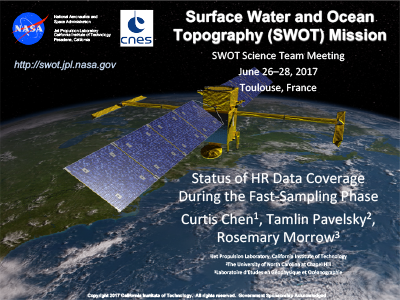 Here, we investigate a means to reconstruct the missing sea surface height signal in time between two satellite revisits. 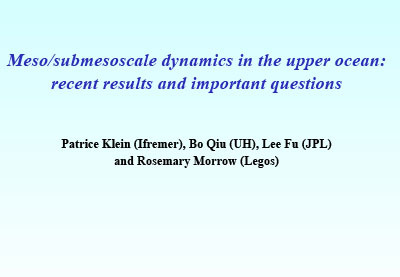 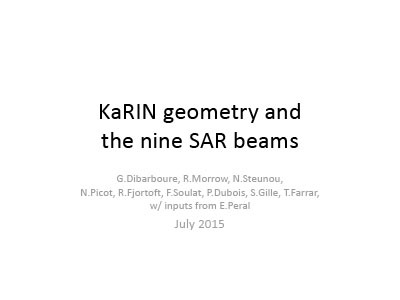 Rogé, M., Morrow, R., Ubelmann, C., and Dibarboure, G. (2017). 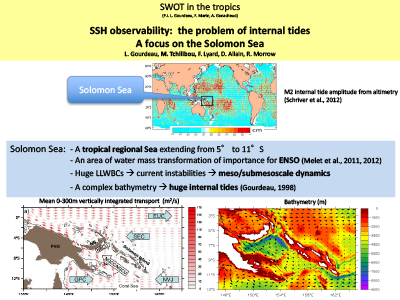 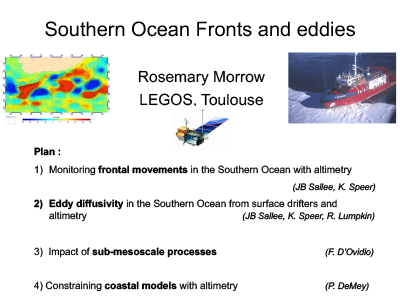 Using a Dynamical Advection to Reconstruct a Part of the SSH Evolution in the Context of SWOT, Application to the Mediterranean Sea, Ocean Dynamics, 1-20, doi: 10.1007/s10236-017-1073-0. 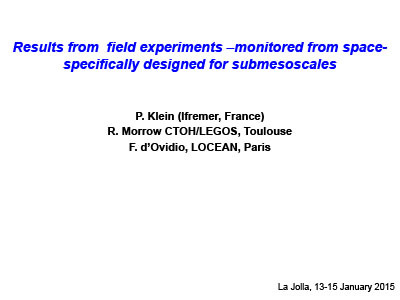 Fu, L-L., Alsdorf, D., Rodríguez, E., Morrow, R., Mognard, N., Lambin, J., Vaze, P., and Lafon, T. (2009). 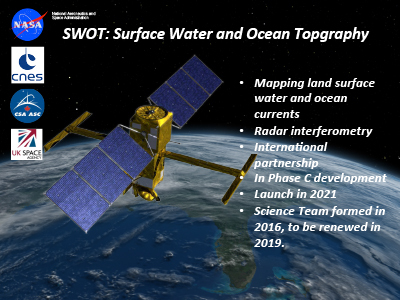 The SWOT (Surface Water and Ocean Topography) Mission: Spaceborne Radar Interferometry for Oceanographic and Hydrological Applications, Proceedings of OceanObs'09: Sustained Ocean Observations and Information for Society (Vol. 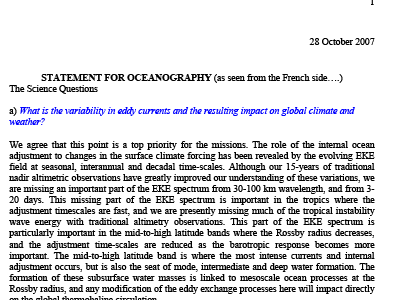 2), Venice, Italy, 21-25 September 2009, Hall, J., Harrison, D.E. 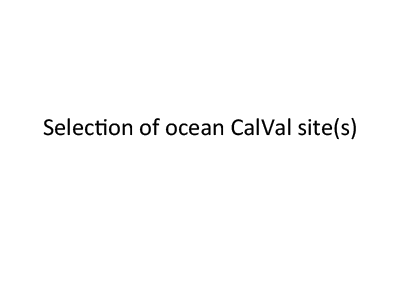 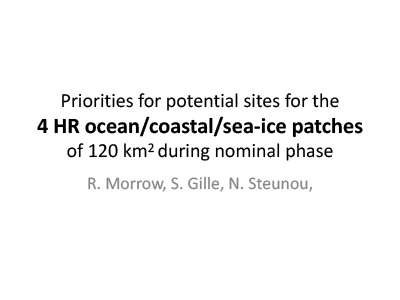 & Stammer, D., Eds., ESA Publication WPP-306, doi: 10.5270/OceanObs09.cwp.33. 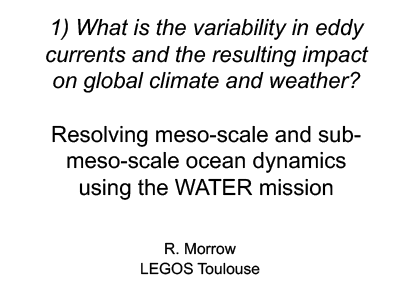 Fu, L-L., Alsdorf, D., Morrow, R., Rodrigues, E., and Mognard, N. [eds]. 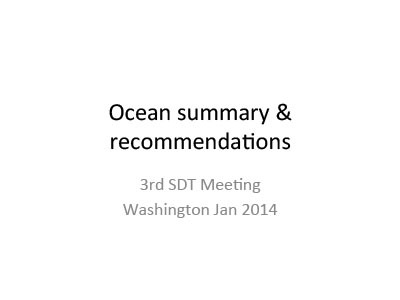 (01-Feb-12). 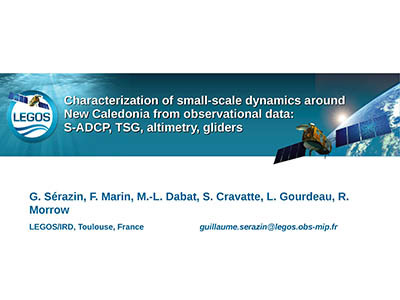 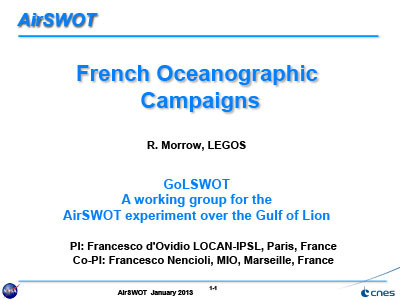 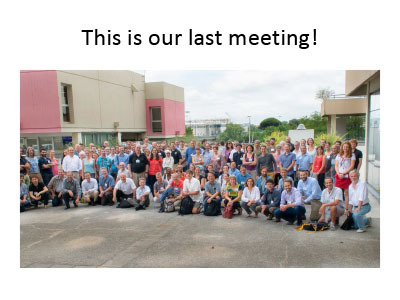 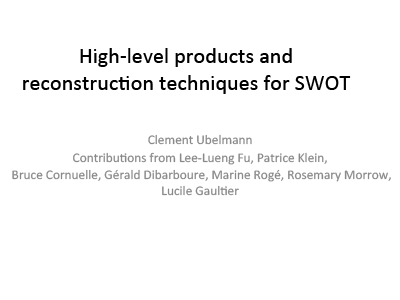 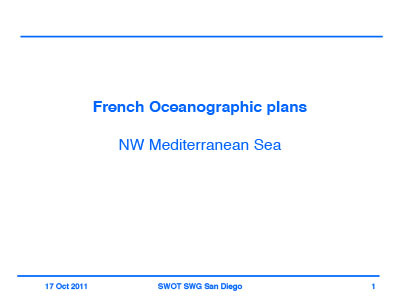 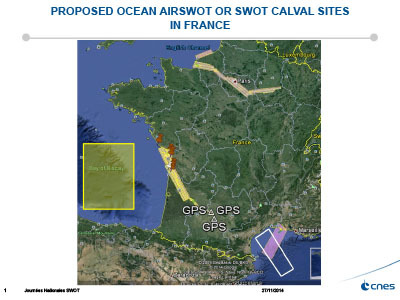 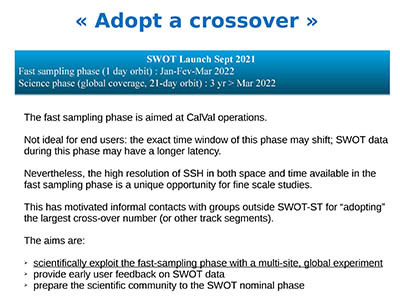 In October 2007, a SWOT Science Working Group (SWG) was formed under the auspices of NASA and CNES with participants from the international communities of oceanography and land surface hydrology. 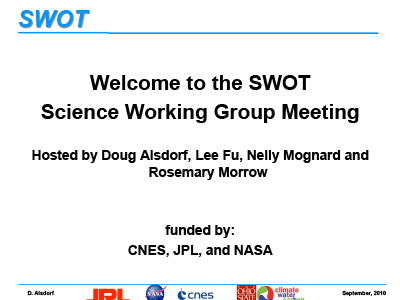 The SWG was charged to provide scientific guidance for the development of the mission, including science objectives and requirements, science payload, orbit selection, and data products. 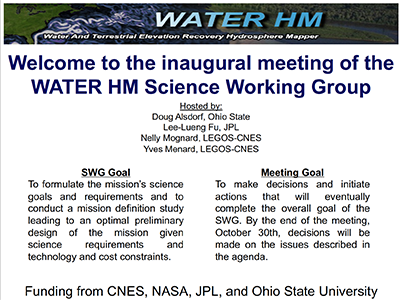 Since the inaugural meeting in October 2007, the SWG has met eight times. 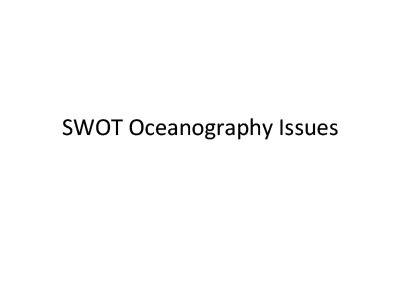 Additionally, a town hall meeting on SWOT was held in the 2008 American Geophysical Union (AGU) Fall Meeting. 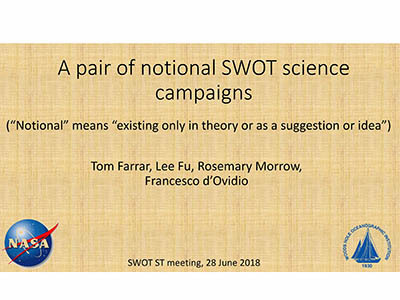 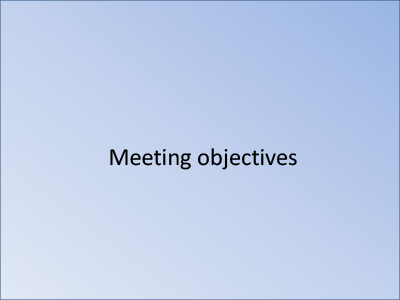 This document summarizes the findings from these meetings with a purpose to provide information on the potential opportunities in science investigation and applications as well as on the preliminary design of the SWOT mission concept. 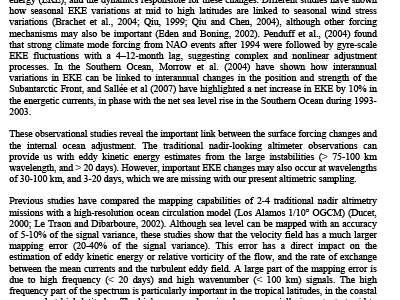 Lindstrom, E., Neeck, S., Vaze, P., Rodriguez, E., Fu, L-L., Morrow, R., Alsdorf, D., and Mognard, N. (11-Feb-09). 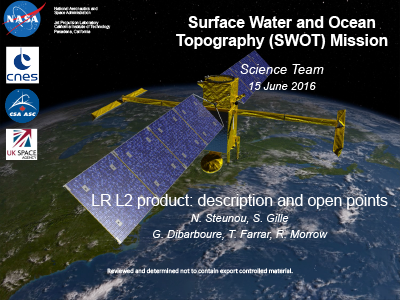 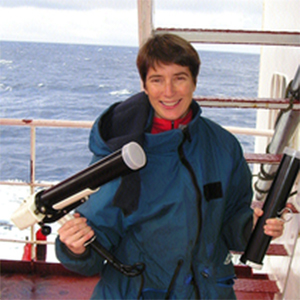 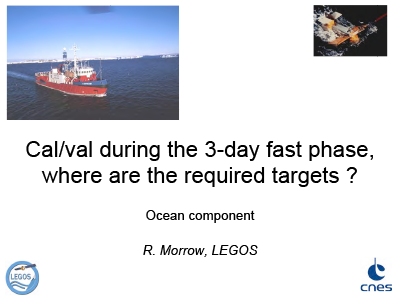 Presentation on the Surface Water and Ocean Topography (SWOT) Mission presented at the Decadal Survey Mission Development Symposium in 2009. 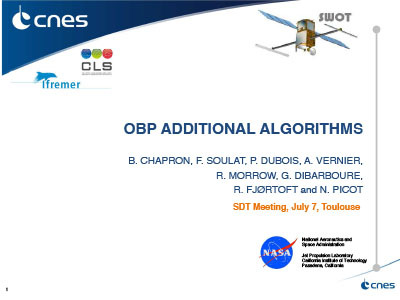 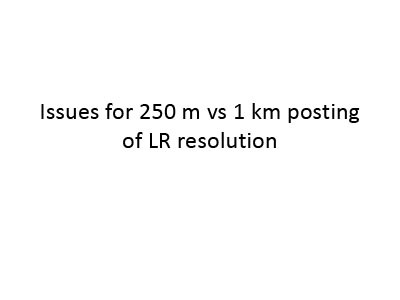 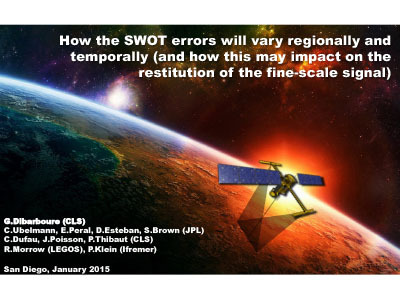 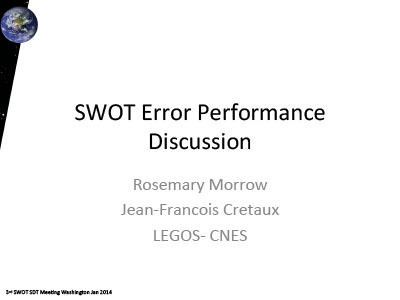 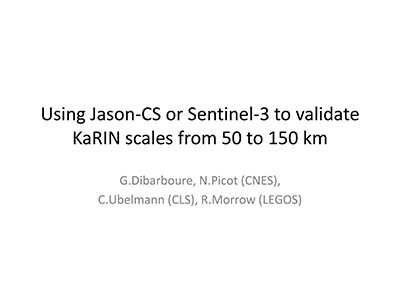 This talk provides background and proposed plans for the SWOT mission.